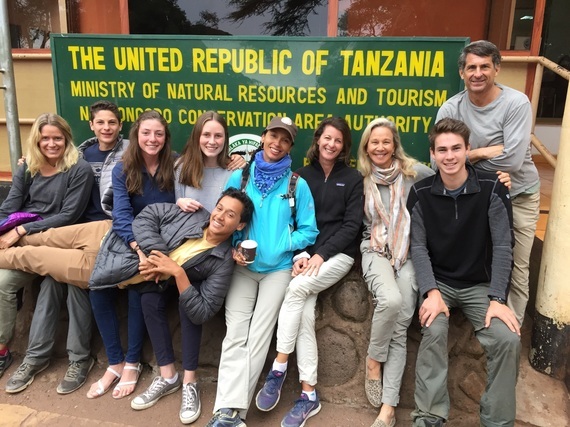 When one of my dearest friends, Suzanne, asked me to join her, Lamel, her children Erin and Chandler at The Legendary Lodge in Arusha, Tanzania a few nights before my son Colin and I were to begin our volunteer work in Monduli, I wasted no time re-booking our tickets so that we could meet her. From toddlers to teenagers, Prague to Tulum, Suzanne and I have logged in over twenty-five years of traveling the world together with our children. No matter where we are, we always have the very best experiences, bordering on exceptional serendipity. Our stay at The Legendary Lodge was no different. There's something magical about being in Tanzania. You are at once surrounded by the exquisite natural beauty, the immense and breathtakingly beautiful African sky and in our case the impeccable attention to grace and elegance in a simplistic way, the perfect confluence between British chintz and African ethnic. That first night we all sat down to a delicious three-course dinner prepared with locally grown vegetables and did what we always do when we are all together - go around the table and ask one question that everyone has to answer. Over the years these questions have ranged from what Superhero you would like to be to what would you do if you were President of the United States, but tonight the question was "What are you looking for in your visit to Africa?" It was my son Colin's answer that caused everyone to pause. At just seventeen years old he is insightful and inquisitive and always gives thoughtful insight that reveal a wisdom much older than his chronological age. He said that he "didn't have any expectations and was open to seeing how the trip unfolded." Whether consciously or subconsciously, Colin was trusting in the Divine and letting the trip unfold. Colin and his classmates Parker, Mackenzie, Andrew, and Sophie were the reason I was in Tanzania. 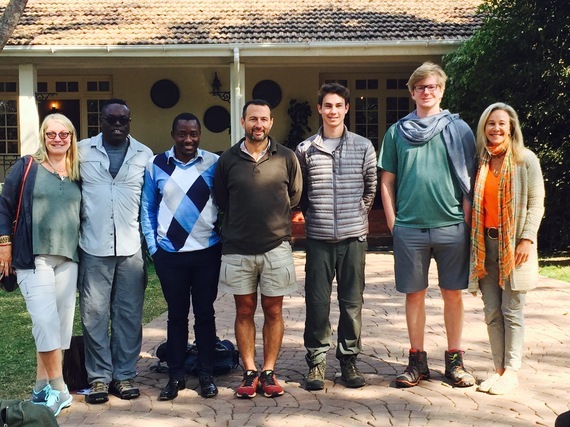 They are all members of the IEFT Youth Board at the Cate School, a group founded by Parker in 2014 and have been raising money for the Orkeeswa Secondary School in the under-served Maasai community in Monduli in Northern Tanzania. I was there as one of the parent chaperones, who later came to be known as Jeff and the Campfire Girls (Yvette, Ginger, Jennifer and myself). "I first visited Orkeeswa Secondary School in 2010 with my family. At the end of our family's safari, we did a small service trip; in which we visited a woman's micro-lending group in Moshi and then went to Monduli to see Orkeeswa. The first time I visited Orkeeswa, there were four buildings, a little over sixty students, and a small teaching staff. Regardless of their limited resources or distance from town, the students had the biggest smiles, best energy, and the motivation and dedication to walk two hours each direction to get an education. Something that has stuck with me since my first visit was when my Mom asked a student how much homework they have a night. They told her it depends on how much sunlight they have when they get home. This put my life in perspective, it made me realize how fortunate I am to have the government to provide a "free" education until the end of high school. That I have light and electricity to do my homework after the sun goes down, and again how fortunate I am to be able to eat breakfast at home because Orkeeswa students leave their house at the crack of dawn to leave for school. After leaving Orkeeswa, I knew I wanted to do something to help, so I asked my parents to host a cocktail party. Luckily they talked me out of it because a ten-year-old hosting a cocktail party might not be sending the right message. My sisters and I ended up throwing a family picnic and concert, but after the first one my older sister went off to high school, and my younger sister found new interests. The following year I organized the fundraiser by myself and with the help of my mom, but it wasn't as much fun. My Mom and I brainstormed to think how could I involve my friends and make working with Orkeeswa more fun, so in 2014 I founded the IEFT Youth Board. The idea was to include my friends and share my passion for IEFT." And now six years after Parker's first visit he returned with his friends and their parents so we could all meet those students whose smiling, energetic and eager faces inspired him to create the IEFT Youth Board. Without the Orkeeswa school, which was founded by Peter Luis in 2008, with a vision to create leadership in the community, there wouldn't be an opportunity for these students to receive free secondary education. The Tanzanian government only provides schooling through primary school leaving only ten percent of the population to receive secondary education. Orkeeswa promotes gender equality in co-educational learning settings. It's a holistic model of learning with a mission to "equip students with the skills to create positive change in their community." Because it's a non-profit the support of volunteers and fundraisers like Parker, Andrew, Colin, Mackenzie and Sophie is much needed. What Parker didn't know when he founded the IEFT Youth Board was that the effects of his vision would do more than financially help the school. Because of his desire to help those less fortunate than himself, he blessed all of us with creating an experience that helped to improve our collective environmental health. People immediately think clean air, water and food when I talk of environmental health, which is all true. But I've learned that a crucial element of environmental health is the company we keep, the experiences we share and the friendships that ensue. It was my son Colin who once again summed it up best when he said that his biggest take-a-way from the trip was the relationships that grew out of it, the deepening of friendship with his classmates and the creation of new ones with the staff and students at Orkeeswa. By following his lead that first night, being open to what unfolded and staying in the moment, I was reminded that it is not just the adventure of travel that enriches us, but our willingness to open up to others and share the unknown inside of us through collective experience, especially those that our children lead us to. If you'd like to find out more about the Orekeeswa School and how you can help, I invite you to visit their website.